The Black Scoter is smaller and less common than the other two North American scoters: The Surf Scoter and the White-winged Scoter. The male has a distinctive round head and yellow-orange bill which is striking against its all-black plumage. The female is quite different in appearance and has a black cap and pale white on the side of the face and neck. When this scoter has its tail cocked into the air, it can resemble a Ruddy Duck, however the Ruddy is much smaller. A sometimes-useful field mark when Black Scoters are in flight is the pale underside of the flight feathers. This can be difficult to see in poor light and so cannot be relied upon. The origin of the word “scoter” is unknown. The first printed reference as a common name was by Ray in Collective Catalogue of Birds (1674) (Holloway). Dawson (1902) thinks it may be derived from this duck’s old name of sea coot, and people calling to it to move it out of the way of their boats. Instead of “Ssss cat!” they would call, “ ‘Ssss you coot! S’coot’ whence Scooter or Scoter, the bird that scoots.” This is at least a possible explanation. Following breeding Western Black Scoters will interrupt their migration and gather in calmer inshore waters at annual molting sites. Males will be the first to leave the breeding area in late June, followed by non-breeding females in late July. 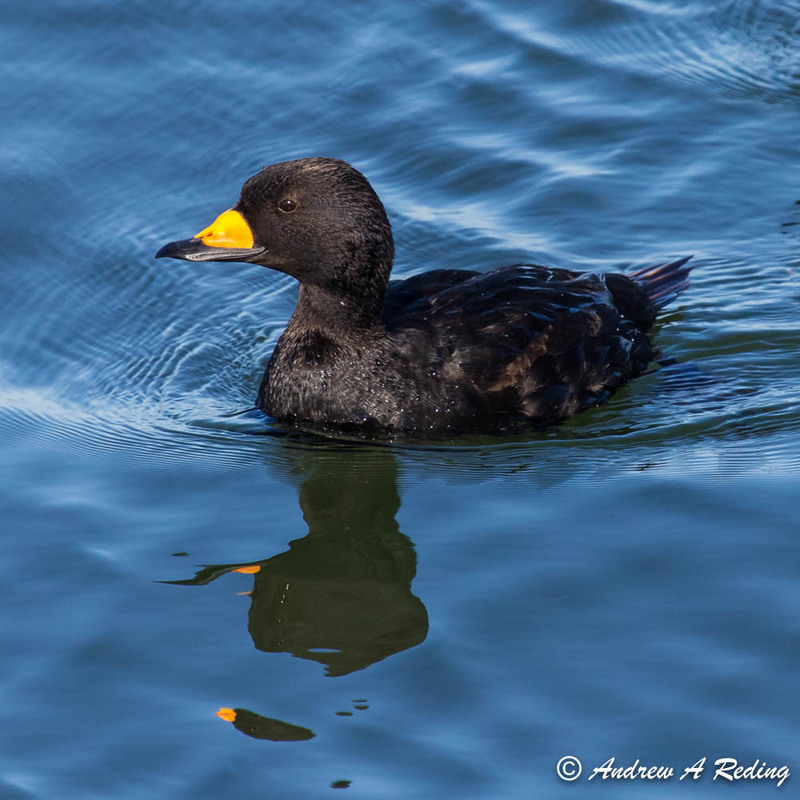 Breeding females and subadult scoters will follow in late August and September. The intermediate molting sites are dispersed through Alaska, western Yukon and British Columbia (Bordage and Savard). Once the molt is completed their flight capability returns, many Black Scoters will continue migrating along the Pacific Ocean as far south as northern Washington. A few Black Scoters can be seen in Washington marine waters in Puget Sound and along the Pacific Coast between October and March. Black Scoters nest in two areas of North American tundra. An eastern population breeds in northern Quebec near Hudson Bay. The western population breeds in Alaska in coastal low-lying wet tundra and some higher slopes in treeless terrain. Males display in the water by swimming quickly with their head down and back bowed while calling and snapping their tail into a vertical position. One female will often be courted by several males. Eight to nine eggs are deposited in the nest which is a shallow depression lined with plant material. Incubation takes about one month, and the young leave the nest and go into the water shortly after hatching and feed themselves (Kaufman). Observers estimate a total of about 51,000 breeding pairs of Black Scoters in Alaska, but research is scarce. There is concern for a decline in the eastern population as there has been an increase in hunting of sea ducks as hunting other duck species has become more restrictive. (Bordage and Savard). The Black Scoter is in the genus Melanitta, meaning black duck, from the Greek melas, black, and netta, a duck. The species epithet americana was attributed to the Black Scoter after it was split from its former congener Common Scoter (M. nigra) in 2010, reverting to its first classification by William Swainson (1789-1855) when it was published in Fuana Boreali-Americana in 1832 (Mearns and Mearns). Photo credit Andrew Reding. References available upon request from amccormick@eastsideaudubon.org.